Guess what everybody? It’s that time of the year again! No, not Christmas. No, not Hanukkah. You know, the time where everyone talks about how stupid the BCS is and then they try to make their own playoff scenario. Yeah, that time. Well, I guess I should give it a shot too. I have seen and heard all of the criticism and ideas about a college football playoff system, but there is a lot I don’t agree with. For anyone who thinks there should be a 16-team playoff: that’s way too many games. You don’t need to give an automatic bid to every conference champion. The Sun Belt Conference champions Florida International, who posted a sub-par 6-6 overall record but won their conference with a 6-2 record in league play, do not deserve to be a part of a playoff. Keep the BCS ranking system. Take the top 12 teams from those rankings and give the top four seeds a first-round bye. Here’s what it would look like, and here’s what I predict would happen. -These are some great games, and would provide for some great television and revenue. Also, giving the top four seeds a bye gives them an advantage that they deserve. The only upset would be Boise St., who would come out with a vengeance after a heartbreaking loss vs. Nevada, and would take down Oklahoma. -Once again, incredible match-ups. These games would earn the NCAA much more money than the the Little Caesar’s Pizza Bowl or Godaddy.com Bowl, right? Oh, you’ve never heard of those games? Oh, you’re not going to watch those? Yeah, I thought so. Anyways, I think Arkansas would beat Stanford, because in my opinion the Pac-10 is overrated. The TCU vs. Boise St. would be a great rematch from last year and would have millions of eyes throughout the country glued to the TV. -TCU takes down Oregon. Once again, the Pac-10 is overrated. Auburn beats Arkansas in what would be an amazing game. -Yep, you read that right. TCU gets the shot it deserves at a national championship, and doesn’t back down. They come out on fire and beat Auburn. -Words cannot explain how special this playoff system would be for college football. There would still be the smaller bowl games, giving smaller schools a chance at another game and all of the advantages that come with it. It would also shed the criticism about the automatic-qualifying conferences, as everyone who finishes in the top 12 would have a shot at the championship. Odds are, this will never happen. But hey, I can have fun with it too right? If you are even vaguely familiar with the NBA, you have probably seen or heard of this scruffed-out man. If you’re one of those who lives within a 300-mile radius of Los Angeles and claims to be a Laker fan once they win the NBA Finals, you definitely know who Pau Gasol is. Whether you know him or not, there is one thing you must admit. This guy is pretty goofy looking. Is Pau an amazing basketball player? Yes, I will admit that. He has dominated the league as of late with his impressive ball skills and soft touch in the paint, and has been an integral part of the Lakers winning back-to-back NBA Championships. He is without a doubt one of the best big men in the NBA today. But seriously man, either shave your beard, or grow it out! For a few years now, Pau Gasol has consistently rocked the “I haven’t shaved in a few days” look. And when I say consistently, I mean every damn time I flip on SportsCenter, I see a shaggy-haired (which doesn’t help the cause), 7-foot giant trotting down the court with his infamous scruff beard. Quite possibly the worst part about it is the neck hair. He clearly shaves his beard to the appropriate length often, I’m sure he has an extra five minutes to clean it up and shave his gross neck beard! But no, that’s not his style. Maybe it’s a Spanish thing. Maybe it’s a superstitious thing. He has become a much better player as of late. Maybe it’s good luck. Who knows. All I know is that Pau Gasol should definitely go back to his old look. He looks much more professional. If he cut his hair short and shaved his nasty beard, his swagger points would instantly skyrocket. He would gain more fans in one day than Justin Bieber’s Twitter account. Probably not, but you get the picture. Do the right thing, Pau. It will benefit all of us. I think it’s time to call it a career. If ever there was a perfect time to hang up the cleats, it’s now. I know its midway through the season, and I know you still think you can lead the Vikings to the Super Bowl, but like it or not, it’s time. After a tough loss to the Packers on Sunday night, the Vikings moved to 2-4 on the season. Even after making a blockbuster trade to acquire superstar receiver Randy Moss, the Vikings are still struggling. Favre played very poor against his old team, as he threw three interceptions, and clumsily fell down on the last play, only to get up and throw an incomplete pass. 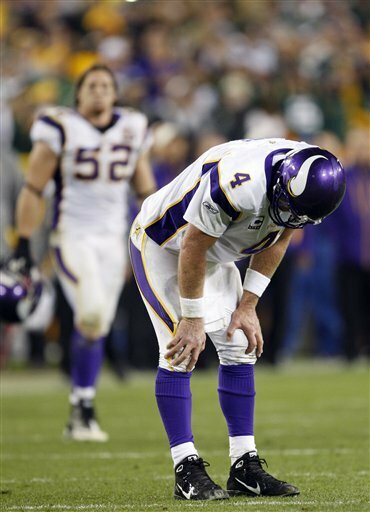 To make matters even worse, Favre suffered an injured ankle that leaves his status for next week uncertain. Reports say it is a fractured ankle, and Favre has yet to say if he will play next week. I’ll tell you what to do, Brett. Retire. Call it quits. Swallow some pride and save your body some years, I mean you want to be able to walk normally when you’re older, right? If you keeping throwing your 41-year-old brittle body into the line of fire, things aren’t going to go well for you in the future. If you’re not careful, you might be rocking some Forrest Gump knee braces a few years down the road. Over the past few years, Favre has brought so much drama to the NFL. From fake retirements to a sexting scandal, he has lost the respect of thousands of fans with his antics. Its tough for me to even write this, considering I used to love Brett Favre. Lately, however, I can’t help but despise his actions. Although I am very critical of the Favre-of-late, one thing I will never lose is my respect for him. His current NFL record of 291 consecutive starts, although likely to come to an end this Sunday, is absolutely incredible, no matter what position he plays. I just think it is in his best interest to call it a career. Not only is it best for him, but it will also be the best for the Vikings. If one thing is certain, it is that no one in the world knows what Brett Favre will do. He has had so many shocking decisions over the years, and he probably doesn’t even know what he’s going to do. All we can do now is wait and see. Good luck, Brett. Hopefully you make the right decision. Hey Gilbert Arenas, what are you doing? Gilbert Arenas has had quite an interesting preseason. The Washington Wizards guard, who has played in only 47 games in the last 3 seasons due to injuries and a highly controversial gun charge, is once again finding himself in the news for all the wrong reasons. On October 6, Arenas was quoted saying, “Right now I’m out there to hit open shots, teach John the ins and the outs of the game, and then eventually go on and move on. I’m on my way.” Speaking about his new, highly publicized teammate, number 1 overall draft pick John Wall, Arenas is basically saying he’s ready to bounce out of the nation’s capital now that he’s no longer the most popular Wizard. Jealous much? This odd interview was just the beginning of Gilbert’s shenanigans. On October 12, The Wizards faced off against the Atlanta Hawks in their preseason home opener. It was going to be his first game in the Verizon Center since his suspension. However, during pre-game shootaround, Arenas told coach Flip Saunders his knee was sore and that he wasn’t going to play. Nick Young played in his place. The next day, Arenas shocked media reporters by telling them he faked an injury so his buddy Nick Young could get more playing time. “I told him I’ll go and fake an injury or say something’s wrong with me so you can start,” said Arenas in an interview with a local reporter. What? Are you serious? Why not just tell your coach the truth? And if you are going to fake an injury, why tell the media about it when you know its going to be blown out of proportion? This guy is going nuts! After this nonsense, the Washington Wizards responded by hurting his pockets and fining Arenas $50,000. Ouch. To make matters worse, just two days later, Arenas suffered a REAL injury. 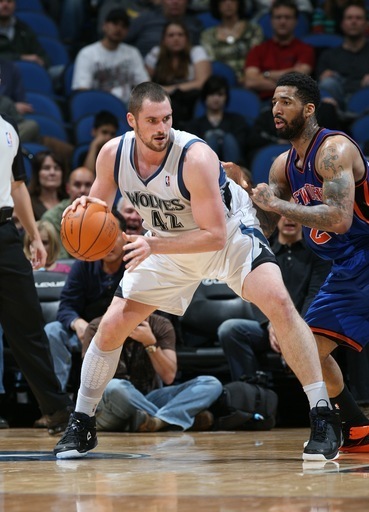 He injured his groin during their next preseason game against the New York Knicks. Poor guy. Things really aren’t going too well for him. After being the laughing stock of the NBA so far this preseason, it will be interesting to see if Arenas can bounce back and compete at the level he did before his issues, when he was one of the top players in the league. Until then, keep an eye out for some more Arenas’ antics. Who knows what could be next.